Check out Sam Roudman’s article “Bank of America’s Toxic Tower” that appears in the latest issue of the New Republic. Roudman is a free lance writer who lives in New York and writes about environmental issues. The Bank of America Tower — the subject of Roudman’s article — is the first skyscraper to earn the USGBC’s LEED-platinum rating. It has been hailed as “the most environmentally-responsible high-rise office building.” Yet when NYC energy benchmarking data were released last November we learned that the Bank of America building used more than twice as much energy per square foot than does, for instance, the 80-year old Empire State Building. This is the third in a series of posts regarding “grade inflation” for the EPA’s Energy Star building benchmarking score. The first article looked at Medical Office buildings and the second looked at Dormitories/Residence Halls. Here we look at evidence for inflation in scores for Office buildings. Energy Star benchmarking was first introduced for office buildings back in 1999. Office buildings are the largest single building type in the commercial building stock. Since its introduction the EPA’s Office model has been revised twice, first in 2003 (based on 1999 CBECS data) then again in 2007 (based on 2003 CBECS data). The CBECS data on which the present model is based are now 10 years out of date. The model applies to office buildings, financial centers, banks, and courthouses – but for brevity I will simply call it the Office Model. The current version of the Office Model used office building data from the 2003 CBECS to define its parameters — that is, model parameters were obtained from a regression applied to office building data extracted from CBECS 2003. Therefore these data cannot be used to independently verify the distribution of Energy Star scores in the building stock. But the 1999 CBECS data do provide an independent snapshot of the building stock that can be used to test whether or not Energy Star scores, as defined by the current Office model, are appropriately distributed. While the building stock certainly changed somewhat from 1999 to 2003, there is no evidence that it experienced significant changes in energy consumption or efficiency. I have extracted all office building data from the 1999 CBECS database, omitting buildings that are outside the scoring parameters of the Office model. (For instance, the model only applies to buildings 5,000 sf or larger. And CBECS energy consumption data are inaccurate for any of its buildings that utilize district chilled water.) After extracting CBECS 1999 data for eligible buildings I used the 2007 Office model to calculate their Energy Star scores, then using the CBECS weights for each sampled building, produced a histogram of Energy Star scores for the entire (eligible) office/finance/bank/courthouse building stock. The resulting histogram is shown below. This histogram represents Energy Star scores from an estimated 314,000 buildings occupying a total of 9.7 billion gsf! The average ES for the 314,000 buildings is 62. The graph clearly shows that the scores are not uniformly distributed and, instead, there is an overabundance of scores higher than 50. A salute to lake Wobegon! The above graph provides convincing evidence that 1) Energy Star scores for Office buildings do not represent their percentile ranking in the office building stock, and 2) that a score of 75 – required for Energy Star certification – does not mean that a building is using 30% less (source) energy than the average office building. Admittedly, this is a test of the 1999 Office Building stock, not the 2013 building stock. But it is not plausible that the commercial office building stock has gotten so much less efficient since 1999 that the histogram for 2013 buildings is uniform. In any case, in 2014 when CBECS 2012 data are released we will have another independent survey to test this hypothesis. To recap – this last week I have looked at the distribution of Energy Star scores for 1) medical office buildings, 2) dormitories/residence halls, and 3) offices/financial centers/banks/courthouses – and in all cases have found evidence that the mean scores for the commercial building stock is significantly higher than 50 – means were 65, 70, and 62, respectively. This provides convincing evidence that the scoring system itself is biased to high scores – and hence the score does not represent a building’s energy efficiency percentile ranking in the population. It would appear that the reason that the mean score for all buildings whose data are entered into Portfolio manager is 62 has a rather simple explanation — the scoring system is biased that way. Sometimes you can’t judge a book by its cover — other times you can. It is worth mentioning that having a uniform distribution of Energy Star scores in the building stock is a necessary, but not a sufficient condition, that the Energy Star score is legitimate. The “bias problems” indicated above can be easily fixed – but it will represent disruptive shifts in the Energy Star score. (How does this impact LEED and other external organizations that have adopted the Energy Star score as their metric for energy efficiency?) After this bias is addressed – there are still legitimate questions to ask about the regression model itself. It turns out that the definition of building energy efficiency is contained in the way the regression model is constructed – choices on regression variables impact the definition of energy efficiency. These issues will be addressed in subsequent posts. Because the Energy Star model for Medical office buildings was based on 1999 CBECS data it was possible to independently test the model predictions by utilizing 2003 CBECS data for Medical Office buildings. What I found was that the Energy Star scores for medical office buildings were not uniformly distributed in the 2003 building population. Instead the results were heavily biased towards higher scores, so much so that the mean score for all Medical Office buildings was 65 — well above the assumed mean of 50. This provides convincing evidence that the Medical Office building model and the Energy Star scores it produces are not valid. The score may still be useful for tracking the relative performance of a particular building over time. But the score cannot have the stated meaning as a percentile ranking of a building’s energy efficiency relative to the national population. In particular it means that quantitative energy savings cannot be inferred from the score. An Energy Star score of 62, for instance, usually suggesting above average performance, in the case of a Medical Office building means it uses more energy than the average Medical office building. And a score of 75 — required for Energy Star certification — does not mean that the building is 30% more efficient than the national average for such buildings. In short, the score does not mean what the EPA has claimed that it means. It turns out that the Energy Star model for Dormitories/Residence Halls is also based on 1999 CBECS data. Hence the Dormitory/Residence Hall Energy Star model may also be tested by applying it to Dormitories in the 2003 CBECS survey and examining the distribution of these Energy Star scores. The results are shown in Figure below. The histogram has the same problems that were apparent in the Medical Office histogram – namely that the scores are biased to the high end. The mean Dormitory Energy Star score here is 70. The graph shows that 35% of all dormitories have Energy Star scores ranging from 91-100. For a uniform distribution only 10% of the buildings would have such scores. The Figure also shows that 9% of all Dormitories have Energy Star scores ranging from 1-30 whereas we expect 30% of buildings to have Energy Star scores in this range. Clearly there is a problem with this Energy Star building model. Scores generated with this model do not have the stated interpretation (as the energy efficiency ranking), clearly are inflated, and simply are not valid. It is now clear that two of the eleven building Energy Star models are invalid. Moreover, the problem I have identified (inflated scoring) for these two types of buildings has been present since both scores were introduced in 2004. It is troublesome to realize that these problems have gone undetected for nine years, particularly when it has long been known that the mean Energy Star score for all buildings whose data have been entered into Portofolio Manager is in the low 60’s. In my future iissues I will take a look at Energy Star scores for other building types and see whether these scores stand up to external scrutiny. ENERGY STAR recently issued a press release stating that “Nearly 40 percent of the nation’s building space is benchmarked in Portfolio Manager, driving billions of dollars of energy savings while helping reduce greenhouse gases in the fight against climate change.” Follow up questions to the EPA yielded additional information that Portfolio Manager has data representing about 300,000 unique commercial buildings containing 30 billion gsf of space. Now according to the latest Commercial Building Energy Consumption Survey (CBECS) conducted in 2003 the nation has about 4.6 million buildings containing 70 billion gsf of space. Ignoring any increase in the nation’s building stock since 2003, that would mean that the 40% of the nation’s gsf contained in Portfolio Manager belongs to only 5% of its buildings. 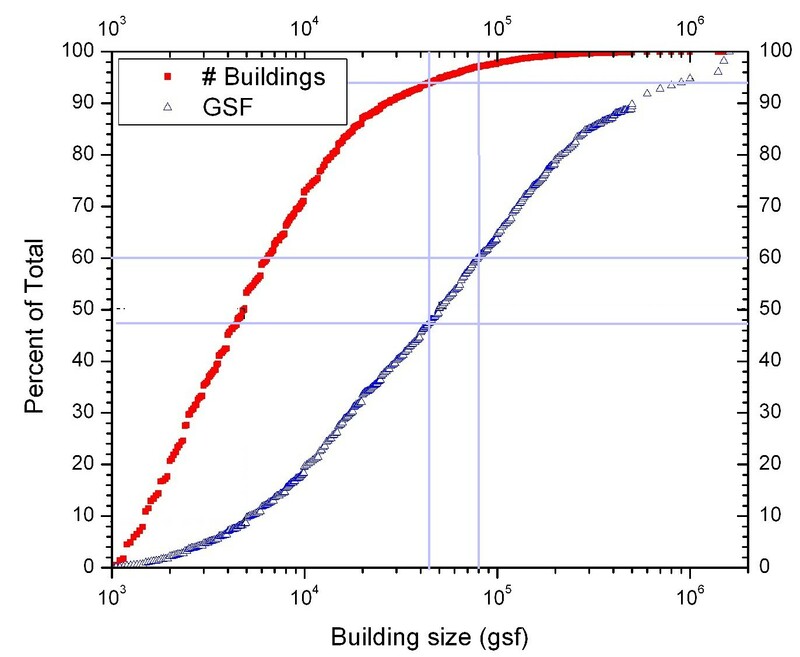 Below is a graph showing the distribution of U.S. Commercial building numbers (red) and gsf (blue) versus building size (in sf) as determined from 2003 CBECS data. The graph shows that approximately half the total gsf is contained in just the largest 5% of buildings (> 50,000 sf). You can also see that 40% of the gsf is contained in the largest 4% of the buildings. Portfolio Manager has data from 6% of the nation’s buildings. If these are the largest U.S. buildings (> 44,000 sf) then this would represent about 52% of the gsf of the U.S. commercial building stock. Instead, Portfolio Manager contains only 40% of the total U.S. gross square footage. This means that Portfolio Manager must have data for about 80% of the nation’s buildings that are 45,000 sf or larger and only a tiny fraction of the buildings that are smaller. Conclusion — Portfolio Manager and ENERGY STAR benchmarking is dominated by the nation’s largest buildings. This raises concerns on several levels. It turns out that the model that EPA uses for calculating Energy Star scores involves political decisions — what energy to allow for. In moving from its 2003 to its 2007 Office model these decisions specifically enhanced the score for large office buildings — making it more attractive for large buildings to adopt Energy Star. Secondly, the average ENERGY STAR score for all buildings that have submitted data to Portfolio Manager is said to be 62. The supposed meaning of the ENERGY STAR score is a building’s percentile ranking as compared with similar buildings. If this is the case then the mean ENERGY STAR score for all large buildings should be 50. But if 80% of large buildings are in Portfolio Manager — how can their mean score be 62? This might have seemed plausible if only a small fraction of large buildings were scored — but with such a large fraction is suggests a kind of “grade inflation.” Apparently the ENERGY STAR score does not mean what we are told it means.